Twenty-five years ago today, President Ronald Reagan stood in West Berlin on a temporarily erected platform. The gray buildings of Soviet-dominated East Berlin were visible through the Brandenburg Gate behind the podium. 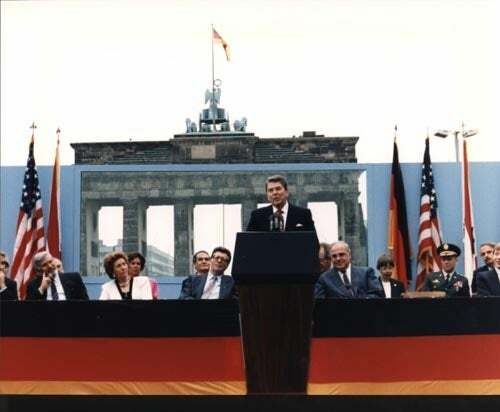 Standing inches away from the tangible manifestation of the Iron Curtain, Reagan faced the crowd of West Berliners in front of him and the Western world beyond. But his real audience was behind him, behind the curtain: He spoke to the millions of people in Central and Eastern Europe held captive by the wall, and he spoke to the Kremlin, addressing Soviet General Secretary Mikhail Gorbachev himself. There is one sign the Soviets can make that would be unmistakable, that would advance dramatically the cause of freedom and peace. General Secretary Gorbachev, if you seek peace, if you seek prosperity for the Soviet Union and Eastern Europe, if you seek liberalization: Come here to this gate. Mr. Gorbachev—Mr. Gorbachev, tear down this wall! At these words, the crowd exploded into cheers. They were not idealizing the persona of Reagan. They longed for freedom. They aspired to the idea and model of liberty that Reagan’s America represented. Winston Churchill had first recognized the Soviet’s menacing consolidation and control of territory following World War II and coined the phrase “Iron Curtain” to describe how Moscow had cutoff half of Europe from the West. With similar foresight, Reagan recognized the Iron Curtain’s impermanence. In this, Reagan was squarely at odds with the best foreign policy minds to be had in America, but the experts were wrong. Two years later, the wall came down; the Soviet Union dissolved. Reagan’s speech at the Brandenburg Gate is a testament to the truth that bold and hopeful words are worth very little without great actions behind them. In essence, Reagan’s explicit challenge to Gorbachev was the culmination of six years of Reagan’s foreign policy strategy, which was guided by his realization that America’s material and moral interests were at stake. Reagan worked to bring all aspects of American statecraft to bear on the ultimate goal of defeating the ideology of communism and the menacing state apparatus that subjugated whole nations in its cause. In all of this, Reagan tapped into a noble tradition of U.S. foreign policy and sought to reestablish America’s proper role in the world. Join Heritage as we commemorate the 25th Anniversary of President Reagan’s call for freedom at the Berlin Wall with a screening of his historic speech.